Students participating in the code_orange program at Northern Illinois University present their work and ideas to peers and company representatives, providing them with an opportunity to experience Discover's company culture. 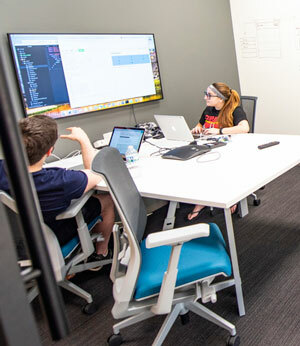 Northern Illinois University recently launched a new program that gives tech-savvy juniors and seniors the chance to develop technologies for Discover Financial Services, working in a space on campus leased and remodeled by the company. For the current semester of "code_orange," as it's called, 37 students were hired by Discover to work on mobile software and Bluetooth development, web application coding and person-to-person payment systems. The work is taking place at the university's collaborative space for innovation, located in the main library, which was renovated over the summer by Discover. Those students chosen need to carry at least a 3.0 grade point average and be majoring in fields related to computer science, operations management or information systems. "Not only am I learning these hard computer skills, but we're having to work in teams, we're having to keep track of our own schedules and hold each other accountable for getting all these tasks done," said Jane Swift, one of students participating this semester. "It's been nothing but a really great experience so far." NIU alumnus Glenn Schneider, chief information officer at Discover, helped spearhead the initiative with the help of Joel Suchomel, vice president of application development for the company. "We are looking at this as a feeder group into our employee base," said Schneider. "We're invested in making sure, as talent coming into our company, we're allowing them to grow and continue to learn in their professional careers just like they've done here at Northern Illinois University." Each semester the company said it expected to do additional recruiting and rehiring for the subsequent semester, with a goal of drawing in up to 50 students for the spring and summer semesters. "This collaboration represents an incredible opportunity for NIU students to take advantage of employment with a premier company," said Karinne Bredberg, in a statement when the program was announced in May. Bredberg is the assistant director for commercialization and innovation in the Division of Research and Innovation Partnerships, and shepherded university efforts to lock down what is being called the "Discover Campus Innovator Program." "Our students will work alongside leading professionals, apply skills learned in the classroom to address real-world business challenges and learn what it's like to innovate within a corporate setting," she added. "Additionally, we hope Discover's presence helps NIU attract other business and entrepreneurial partners to this collaborative space, where they can engage with our top students."